Wouldn’t it be great if you looked in your desk drawer today and found a $20 bill sitting there? You could buy lunch, maybe take the family out for ice cream after work. Not a bad find, right? Found money is pretty hard to beat and certainly doesn’t happen as often as we might like. If you are a business owner, finding money that you can use to reinvest in your company is likely a topic you discuss with your accountants each year. Many business owners are looking to improve processes and find efficiencies that will add to the bottom line and improve profitability. In today’s challenging markets, every penny counts. Fuel cost is a major decision making driver in businesses today, whether it be for transportation, heating or manufacturing. None of us can really reduce the price of fuel, but we can reduce overall fuel cost by reducing consumption. For example, large truck fleets find pennies each mile by using more aerodynamic trucks or more fuel efficient diesel engines. Over the course of a year these pennies add up to real money. ABC Baking Company is a commercial bakery. They run 3 shifts per day and rely upon their hot pressure washer for sanitary needs throughout the plant. Currently they have an electric motor / natural gas heated, stationary pressure washer with multiple user stations piped throughout the facility. The machine produces 3000 PSI @ 4 GPM with an output water temperature of 200 degrees. This machine utilizes about 400,000 BTU/hr. The company averages about 40 hours per week wash time between 3 shifts (40hrs / 5 days = 8hrs per day / 3 shifts = 2.67 hrs per shift per day). Given this scenario (and today’s average fuel prices in the northeast), ABC Baking Company is spending about $14,185.00 annually in natural gas usage for this pressure washer. If this were propane being used, the company would be spending $36,786.00 annually and if this were an oil fired machine, the company would spend $21,050.00 annually. These are significant amounts of money for any business. With fuel prices what they are today, manufacturers are focusing on building more fuel efficient products to offer their customers. From hybrid or electric cars to high efficiency residential hot water heaters, technology is allowing us to save money in both our personal lives and our businesses. At Power Eagle Cleaning Systems, we are now incorporating technology into our equipment that is unmatched in the industry. The Power Eagle HS Series units feature ultra-high efficiency heating systems that allow companies to significantly reduce fuel costs to the extent no other manufacturer can duplicate. What’s better, this new technology is as simple as it is revolutionary. The HS1-3004 operates at 3000 PSI @ 4 GPM with 200 degree hot water output temperature. There are no performance differences or compromises. The difference comes when we examine the BTU/hr specification on the HS1-3004. To produce the same amount of hot water as the previous unit mentioned above, our HS1-3004 only utilizes 240,000 BTU/hr. Given the same 40 hour per week usage, the company will spend $7,737.00 on natural gas, saving $6,448.00 for the company annually. The annual savings for propane would be $16,743.00. Naturally, the next question is “how are you able to provide this level of fuel efficiency?” The answer is more simple that you might think. 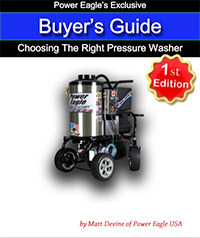 Every hot pressure washer uses a fuel to heat the water flowing through the system. Our HS Series units are no different. Our efficiency is gained when we capture and utilize the wasted heat energy in the burner exhaust and use it to preheat the inlet water prior to entering the water pump. So, instead of the pressure washer pumping 45 or 50 degree water and heating it up to 200 degrees in the heat chamber, we pump 90 degree water and only have to produce 110 degrees of heat rise in the heat chamber to reach the 200 degree water output temperature. 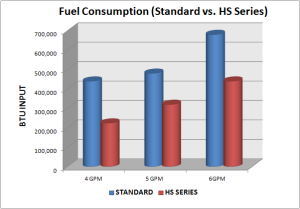 As a result, not only are our HS units more fuel efficient, they also have far lower exhaust port temperatures. Traditional gas fired pressure washers have exhaust flue temperatures of around 600 degrees. With the ultra-high efficiency heating system on the HS units, our exhaust temperatures are a low 90 degrees. Aside from fuel savings, the Power Eagle HS Series units will also save significant money in installation costs compared to traditional style units. 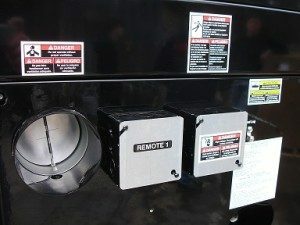 HS machines feature a power vented exhaust system with the outlet port on the back of the machine. Given the low exhaust temperatures, these units can be safely exhausted using simple and low cost CPVC pipe, saving customers thousands of dollars. This is because traditional style pressure washers require expensive double or triple wall vent pipe, typically installed by an HVAC contractor. Furthermore, the installer would cut through the ceiling and/or roof which adds to the level of complexity. With the Power Eagle HS Series units, you avoid all this.pressure washers have exhaust flue temperatures of around 600 degrees. With the ultra-high efficiency heating system on the HS units, our exhaust temperatures are a low 90 degrees. Our testing shows the 4 GPM Power Eagle HS Series units (model HS1-3004) can deliver 49.09% fuel savings compared to a traditional style machine, both with natural gas fired burner. Significant savings are also seen in our 5, 6, 8, 10 and 12 GPM units for both propane and natural gas fuels. Businesses can actually make a simple calculation and determine when the unit will pay for itself. Once the breakeven point is reached, the unit is providing bottom line savings each year, every year, for the life of the machine. No other pressure washer can offer this promise. 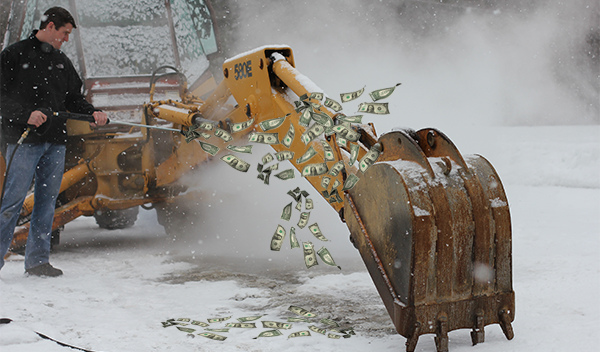 So, next time you look in your desk drawer and don’t find any forgotten money, consider adding a Power Eagle HS Series unit to your business… its the next best thing. 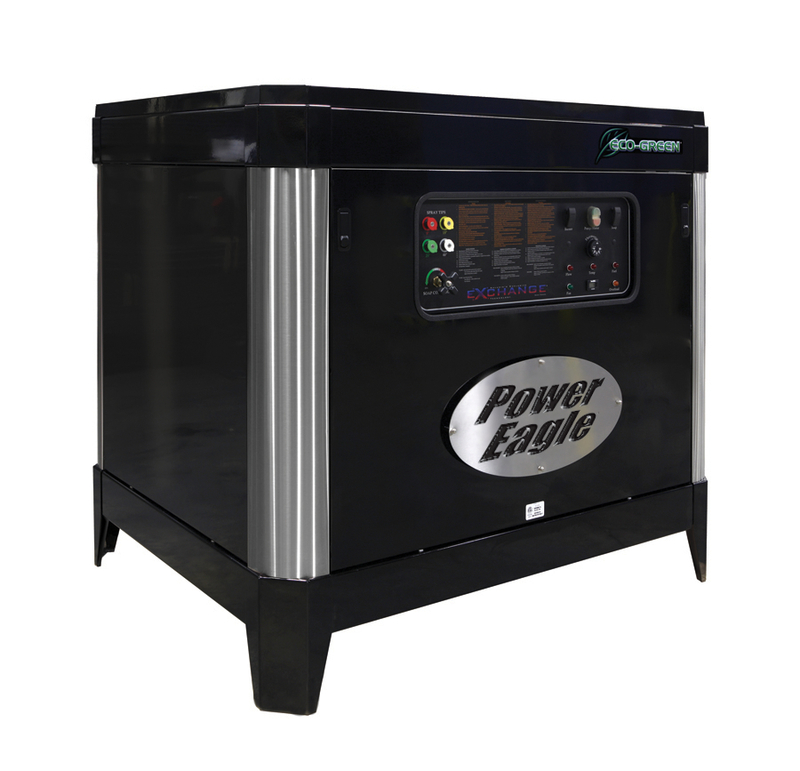 To learn more about how our Power Eagle HS Series hot pressure washers can save your business money, call 800-422-2332 and speak with a member of our knowledgeable sales team.